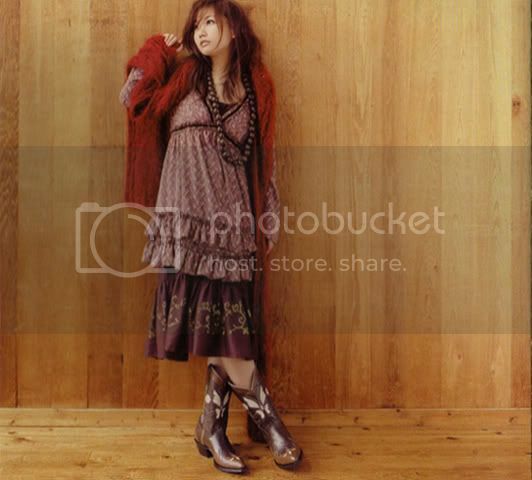 Forum Index » Ai's Chat Room » Favorite Ai-Chan Picture? The full version's on Friendster courtesy of the Ai Otsuka Club. Those photos at the beach are stunning, almost surreal. I feel like I'm looking at snapshots of someone's dream. Pretty cool. I'm guessing these are from the legendary first photobook that I will never ever get to own. I'm always late to fandom! So how about y'all? Well, this is quite difficult to judge, too many photos to be chosen. @chokokoa: ^_^ It looks like you like Ai in her natural look. I also really like that one second from the bottom on the right. I would kill for hair like that. Yeah, I like her natural look. The photo you've mentioned is around November 2004. Oh that's surprising! I thought she was still in her cutie-pie goofy hair-style phase, a la Sakuranbo, in 2004. I think she's got a hair cycle: crazy, chic, cute, and now she's back in the crazies, so next time we see her she's going to look like she lives in a Pantene ProV commercial. of course, portrait-style photos of her can be stunningly beautiful but i really love photos of her at candid moments, where more of her personality comes across. there is a screen capture of her on a torrent of a TV program at jpopsuki. she might have just won a quiz or something. Nice screencap (the 1st pic)! Yeah, I sometimes really like when she doing " ", etc. @pon pon: The screencap from Kingyo Hanabi is awesome. Such an intense performance! I also really like May-chan's bottom screencap. @Calander shot: Shirtless Ai, whoa. Still very classy though. @sanzo2011: That clip of her on page four (bottom row) is awesome. So cute! You're right. Fourth from the left, right? THanks ! great that people love my collection ! ^^!